The below cost guide will give you an idea of the average costs of flower arrangements however it is just a guide and prices can fluctuate through the year. We are proud to specialise in a custom design service to our clients, which means we tailor each design with shades and varieties to accentuate your colour palette and unique wedding style. 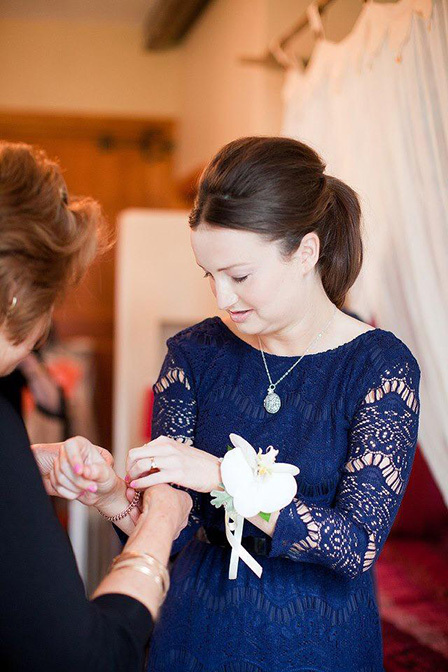 This service includes a consultation, quotations, and our attention to detail whilst planning and designing your floral arrangments in the months leading up to your big day. We are more than happy to provide you with price estimations, advice and ideas via email and over the phone to help with your planning and budgeting. Then should you like to proceed with an official quote and consultation we can arrange this for you at the soonest convenience. Consultations are typically 30 minutes to 1 hour long and then we will create for you a detailed quote along with images and varieties so you are comfortable with the final designs. The quotation is usualy recieved within 7 days from your appointment. We recommend bringing along any fabric samples, colour swatches or pictures to help us provide you with accurate quotes and fitting concept suggestions to accentuate your chosen themes and colour schemes. An idea of what you like before you come to consultation is highly recommended, if you have no idea, let us know in your initial contact and we can steer you in some helpful directions. Consultation appointment times are available 11am - 7pm week days over summer and weekdays and weekends over winter. We are located In Browns Bay on the North shore. We understand that it can be overwhelming choosing your flowers. Our advice is that you follow your own personal tastes as it is your special day. There are no set rules about what you must have for flowers these days. Some couples focus on personal flowers, while others use the bulk of their budget on their venues. We aim to make choosing your flowers simple and easy. To help with the planning process below are some of the many floral options most commonly asked for by our clients. ...... can be as petite and manicured or as full and abundant as you desire. You can let your imagination run free with your choice of stunning blooms and foliage. From simple and elegant, to flamboyant and exotic, the possibilities are endless. Consider finishing touches such as Swarovski crystals or delicate glass beads to add a unique aspect to your design. Bouquets are bound in materials to suit your theme; this can range from natural and simple with visible stems or with a French cuff of ribbon and pearl pinning. Think about using interesting ribbon fabrics and finishing the binding with a beautiful brooch, beads, gems or even a small picture of a loved one. Your wedding bouquets play a very important role on your wedding day. They will feature in the majority of your wedding photos and will serve to beautify your wedding. 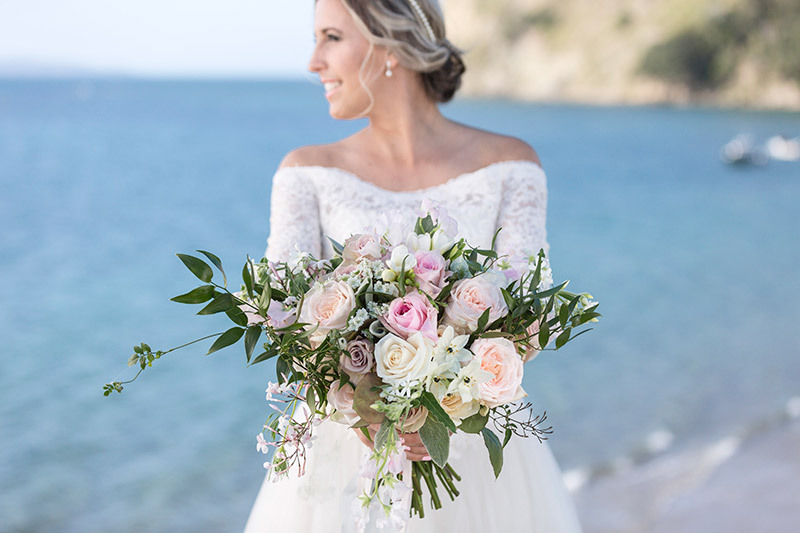 Bridal bouquets take centre stage by accessorising the bride and her gown. Bridesmaid's bouquets should also accessorise the bride and her flowers and are often in smaller complementary styles. A full lush posy of mixed blooms in colourings to suit your themes. With or without foliage and bound in complimenting ribbon. Suitable blooms include; roses, calla lilies, hydrangea, lisianthus, and freesia. Price includes; design and consultation, construction and labour with your choice of blooms, your choice of fabric bindings, crystal or pearl fastenings and packaging on the day. Wired and specialty blooms incur additional costs. Priced on Inquiry. With your choice of bloom and colourings. These blooms are specially constructed on long wires perfect for your hair stylist to work with. Blooms that will last well on your day include orchids, roses and lisianthus. 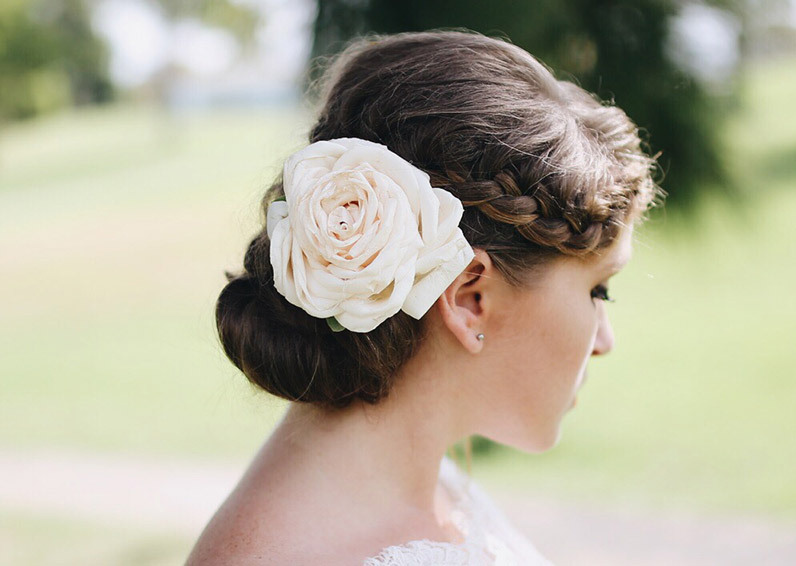 Individually wired blooms for your hair, created to complement the chosen style. 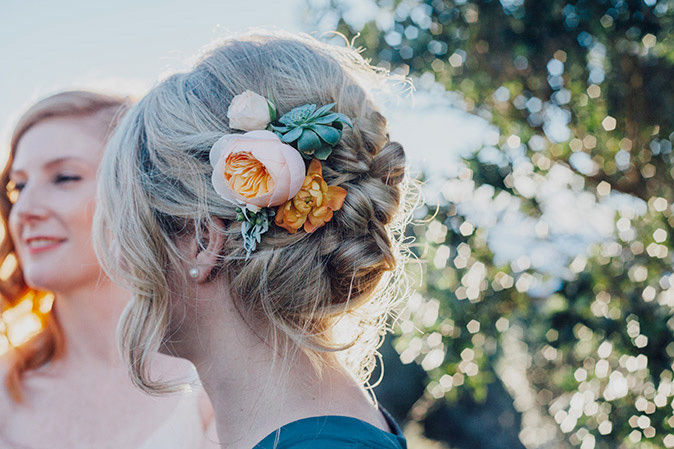 Hair flowers are specially wired in accordance with the needs of your hair stylist. With your choice of bloom and colourings. These blooms are specially constructed on long wires perfect for your hair stylist to work with. Blooms that will last well on your day include orchids, roses and lisianthus. Price includes; design and consultation, construction and labour with your choice of blooms, your choice of fabric bindings , crystal or pearl fastenings and packaging on the day. Flower crowns or circlets are a gorgeous accessory for flower girls. We create these to measure with your choice of blooms and colours. Small delecate flowers such as spray roses are recommended. With your choice of bloom and colourings to accentuate the bouquets and tie the entire wedding party together. Essential to gorgeous and memorable wedding party shots are floral accessories for grooms, groomsmen, fathers, mothers and family members. These are typically decorative buttonholes and corsages to complement the bridal flowers. Try adding touches of interest to buttonholes and corsages with interesting foliages, succulents, flax weaving, grass loops, crystals, berries or beads for example. Created to match bridal flowers with complementary blooms. Buttonholes are usually worn by male members of the bridal party, ie. grooms, groomsmen, fathers, and grandfathers. Price includes; design and consultation, construction and labour with your choice of blooms, your choice of fabric bindings , crystal or pearl pins and packaging on the day. With your choice of blooms and colourings. Essential to gorgeous and memorable wedding party shots are floral accessories for grooms, groomsmen, fathers, mothers and family members. 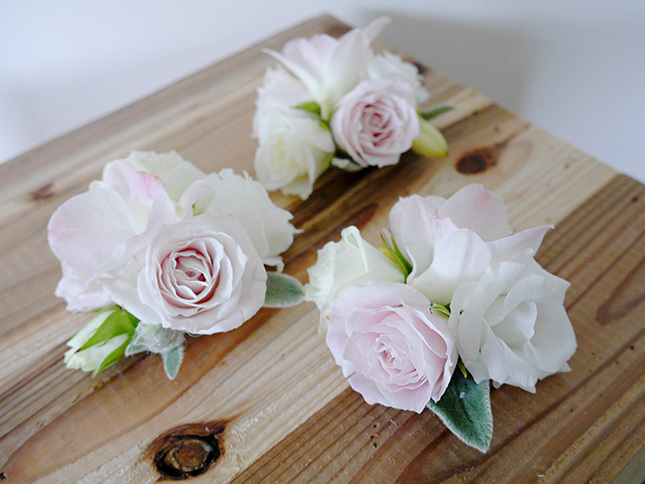 These are typically decorative buttonholes and corsages to complement the bridal flowers. Try adding touches of interest to buttonholes and corsages with interesting foliages, succulents, flax weaving, grass loops, crystals, berries or beads for example. Created to match bridal flowers with complementary blooms. Corsages are larger and more detailed than buttonholes and usually worn by female members of the bridal party, ie. mothers and grandmothers. Price includes; design and consultation, construction and labour with your choice of blooms, your choice of fabricor pearl bracelets and packaging on the day. With your choice of rose petal colourings and basket decoration. Flower girls baskets can be tinted in your choice of colours, and detailed with ribbons. With your choice of bloom and colourings. Dressed single blooms or small clusters of blooms are great for the little members of your wedding party. Large floral arrangements to decorate your ceremony and reception venues. Created with your choice of blooms, colourings and vase. Large vases of flowers to frame your altar or mark the space for your ceremony are a great idea to beautify your wedding space. We recommend large full blooms such as hydrangea, lilies, peonies, and stock to get maximum volume in these arrangements. Floral arrangements tied to the pew ends to decorate your ceremony venue. Can be created using single blooms or small posies, with your choice of flowers and colourings. Spread your flowers across the room to make the most of the space by using pew flowers and bows. This is a great cost effective way to beautiful a church or any aisle. Floral arrangements to adorn your alter archways and venues. Dress archways, gazebos and altars with flowers for a romantic look. Arches can be wrapped in fabric and vines and adorned with clusters of blooms in your choice of colours and varieties. Are a great way to create a beautiful romantic wedding aisle. Works great on grassy areas and directs your guests of where to stand. A long and low arrangement to adorn the head bridal table, in your choice of blooms and colourings. The design can be accentuated with a bed of rock salt crystals, leaves, pebbles or mirror tiles and can be surrounded with tea light candles. Or smaller arrangements priced per individual arrangement. There are many alternative designs available including vases for your bouquets to be displayed in along the head table. Inquire with us for more options. Embellish your tables with floral details to accentuate your themes and colourings. In your choice of bloom and ribbon. Created with your choice of blooms and colourings to accentuate your wedding cake. 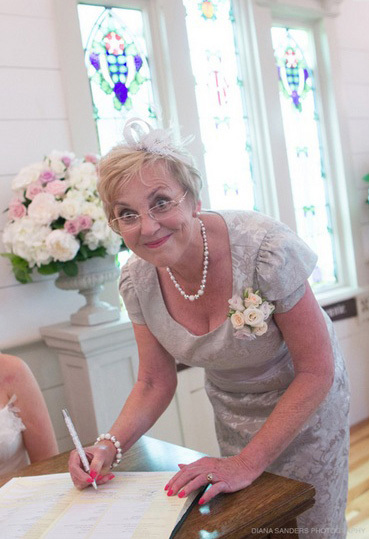 Blossom Wedding Flowers offers a versatile venue set up service. We can provide a full set up on the day or a partial set up so you are welcome to DIY. Vase Hirage: We have a large selection of hire vases available in a style to suit every wedding. Set up Rates: Our venue set up rate is $60.00 per hour/per florist, the average venue set up is 1 -2 hours (minimum 1 hour). Venue Delivery: We will deliver to any venue within the Greater-Auckland and Wellington area. Our delivery rate is $3.00 per/km + $10.00 per each additional delivery address. For large wedding set ups we may require extra van transportation for your flowers and this will be priced on per job. Collections and returns: We can collect vases from the venues after the wedding. Collection fees are priced per job. We also appreciate that our clients may want to enjoy our flowers arrangements after the wedding and return the vases themselves to save a collection fee. Vase return times are within 4 days of the wedding. Collection times MUST be flexible to allow for our busy wedding weekends. We will not be able to accomodate inflexible venue collection times in our peak busy periods. We offer an in house delivery service between 10am - 5pm, 7 days a week, so that your blooms are delivered fresh and at the requested time on your big day. The delivery charge is $3.00 per km + $10.00 per each additional delivery address. Deliveries outside of these hours may be charged at special delivery rates to account for overtime hours and traffic. Booking Fee and Balance Payments: Blossom Wedding Flowers will retain a 20% booking fee to secure a date in advance. Full payment is to be made at a minimum of 14 days prior to the wedding date. Final Confirmations: Final confirmation of all floral items is due no less than 28 days prior to the wedding date. Changes after the confirmation date will incur additional late fees. Hired Items: All hired items are to be returned within 4 days of the wedding. Collection charges are additional. Late, unreturned or damaged items will incur an additional charges or replacement fees. Full replacement or repair costs, will be charged for damage to or loss of any hired items or packaging. All hire items become the responsibility of Hirer, during the hire period. Bonds for hired items will be returned to the customer via a bank transfer on return of the hired items. The bond amount will be based on the vessel type and number. Substitutions: Should varieties be unobtainable for unforeseeable circumstances the closest available varieties will be substituted. We reserve the right to make substitutions in the event the flowers received are not of the quality suitable for your wedding. In this event, the integrity of the proposed colour scheme will be maintained and flowers of equivalent value will be used. Cancellations: Client cancellations will forfeit deposits paid to compensate lost business and labour.